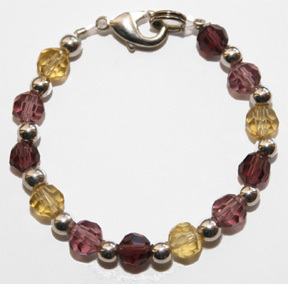 Purple and yellow beads softly change hue as they circle this stunning bracelet. Sterling silver lobster clasp and silver plated beads. Shipping: Free 1st Class shipping! Allow 2 weeks for delivery. * Sizes are approximate, so to ensure that your baby gets the best fit, measure the wrist and order according to length rather than age. Warning: These baby bracelets and/or their components are small and pose a choking hazzard to infants. Never leave an infant or child unattended when wearing a bracelet. Furthermore, these infant bracelets are not intended for unsupervised, daily wear.